Successfully Added USB + SD Card Media Player for TV to your Shopping Cart. This is a simple and elegant multimedia device with SD/MMC and USB ports. Coming with an (HDMI) high definition multimedia interface output, which gives you best image clarity on your LCD TV. In addition, the CVSB-E39 also comes with RCA outputs including surround sound outputs giving you the best of home theater entertainment. This stylish electronic media player will go great any decor, and provide you with super fast access to all your portable digital media files stored on your SD card, USB drive, iPod Shuffle, MP3 and MP4 players, and can also play Real Media and VOB files. This model is compatible with both NTSC and PAL formats, meaning this player will work world wide, and that includes North America. 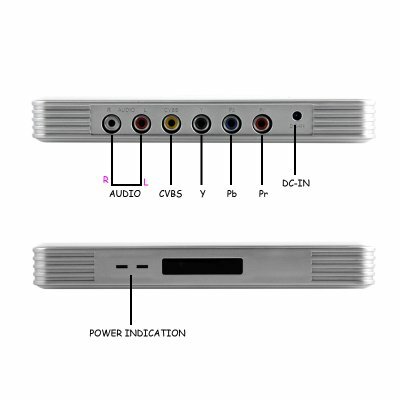 The CVSB-E39 is a user friendly digital media player with simple menu navigation system and straight forward operation. Designed to simply provide you with simple and efficient access to your digital files with the use of the remote controller or the on board buttons. To get a more rewarding performance from the CVSB-E39, connect the RCA cable or an HDMI cable from the CVSB-39 to your TV, and connect the YPbPr cable straight to your stereo system for optimum surround sound. The CVSB-E39 is available in stock today for single and bulk purchases, so get yours today, and while your at it get a few to resell on eBay or to friends and family, this way you cover the total cost of your entire purchase. This media entertainment station is proudly brought to you from the leader in factory direct wholesale electronics, Chinavasion. Does an HDD have to be installed in to the CVSB-E39? No, the CVSB-E39 comes with a USB slot and a SD card slot for simple and effective viewing of your digital content on your TV. With compatibility to use other media electronic devices as well. Does the CVSB-E39 also come with YPbPr cables to connect to my Subwoofer? Yes it does, enjoy listening to your favorite music in surround sound, You can eve connect your MP3 player to the CVSB-E39 and play files straight from your MP3 and MP4 players. muchas gracias chinavasion! el producto llego rapidisimo y esta buenisimo! Se ve muy bien! Gracias!!! on 2010-06-11 00:45:41 Great Product! Very easy device to work with. It recognizes many different formats and plays all of my avi videos flawlessly. This is my 2nd Media Player purchased from this site. Is it possible to make renovation of pleyera indicated in order to look video of formatsMKV. If it is possible, then as this make? !